Delta celebrates the 150th anniversary of Canada today with a fare sale to and from 11 Canadian destinations. 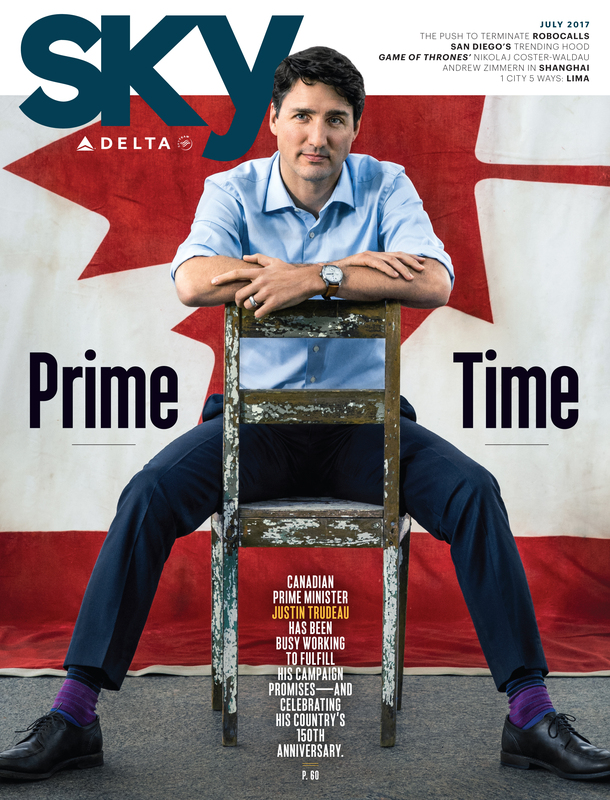 The sale was announced at an event at the Bombardier Aerospace facility in Mirabel, Canada, where Delta also unveiled its July Sky magazine cover feature on Prime Minister Justin Trudeau. The airline will operate specially outfitted Canada Day flights featuring Canadian snacks on select U.S.-Canada flights on July 1. Customers can visit delta.com/150 or call a travel agency in Canada to access a fare sale in honor of Canada’s Sesquicentennial. Discounted fares for travel to and from 11 Canadian destinations Delta serves are available starting Jun. 27 through July 31. Travel must begin on or after Sept. 5 and must be completed on or before Dec. 20. Fares are available starting at CAN $189/USD $109 each way, based on required roundtrip purchase. Additional fees/restrictions/baggage charges may apply. For fare rules, restrictions, fees and baggage charges, see the full Terms and Conditions at delta.com/150. The July issue of Sky Magazine features Prime Minister Justin Trudeau on the cover with an accompanying feature that presents an in-depth look at the Prime Minister’s connection with Canada and the challenges and opportunities he faces leading the country. In addition, Delta CEO Ed Bastian’s monthly letter addresses Delta’s service and history in Canada. On July 1, customers on more than 130 Delta flights to and from Canada will enjoy a complimentary Maple Crème Cookie containing pure Canadian maple syrup from Heart Industries Ltd, a creator and marketer of Canadian made specialty gourmet products and confections since 1978. Delta’s frequent Canadian service from its U.S. hubs include flying to and from Victoria, Vancouver, Calgary, Edmonton, Saskatoon, Winnipeg, Toronto, Ottawa, Montreal, Quebec City and Halifax. Delta and its regional affiliates were among the launch customers of the Bombardier CRJ aircraft, a relationship that has lasted decades and continues on as Delta anticipates delivery of its first C Series aircraft in mid-2018. Delta’s service to Canada dates back to the mid-1930s by way of carriers that merged with Delta over the years, including Northeast Airlines, Western Airlines and Northwest Airlines. Editor's note: The section on the fare sale has been updated.